Polypropylene Strapping is the most commonly used and least expensive of all strapping materials. It's light and easy to apply and recycle. These Hand Grade Strapping, Machine Grade Strapping, and Signode Comparable Strapping are perfect for bundling, packaging, sealing or securing your products, boxes or objects. 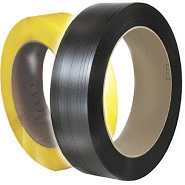 Poly strapping is available in both hand grade and machine grade and can be sealed with buckles, seals, heat seals, or with a friction weld strapping tool. Use poly strapping for light duty palletizing, unitizing, carton closing, and bundling. It is used in all semi-automatic strappers and nearly all stand alone arch machines. 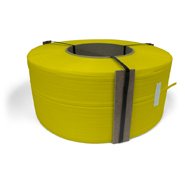 We also offer Steel Strapping and Polyester Strapping. This guide is to help you determine what type of strapping you will need for your application. The three basic types of strapping are steel, polyester and polypropylene. Applications: For use with sharp objects like pallets of brick, where low flexibility is desired. Also, use in applications with extreme heat.